BEST CHOPPER. PERIOD. - This is the most dependable, well-constructed chopper you will ever use. Period. Clean cuts, quick and easy cleanup, solid stainless steel construction and it’s dishwasher safe. ALWAYS SHARP - No more mushing foods with your old chopper. The sharp beveled blades cleanly cut through all types of food. DURABLE & MODERN - The modern stainless steel construction will not only compliment your gorgeous cooking space, but it will be the last chopper you ever have to buy. 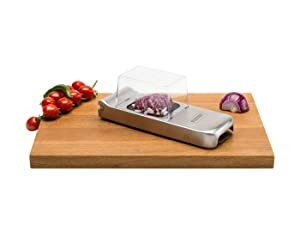 THREE BLADES & NO MESS - Each Chopper comes equipped with three interchangeable blades to combat various food types, and the Collector cleverly keeps what is chopped in one spot. Invigorate your cooking expertise with this wonderful patented food cutting invention from Sweden. The Stainless-Steel Chopper is a must-have wonder in the home and professional kitchens. It is simple to use, effectively cuts and is exceedingly durable. While the secret is already out with top chefs in many fine kitchens around the world, we are proud to exclusively offer you this and many other modern kitchen cutting tools. True to Swedish simplicity and elegance, the idea is to save you energy and time while preparing precise cuts of food. 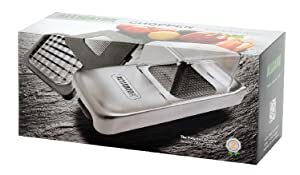 This is accomplished as the multiplies your effort with a downward chopping motion by using the cutting ability of multiple knife blades at the same time. It is also much safer than using a single knife while trying to hold food that can unpredictably slip out of your hand. The Chopper eliminates this problem too, with its robust construction to ensure your food stays put because it holds as it cuts down. 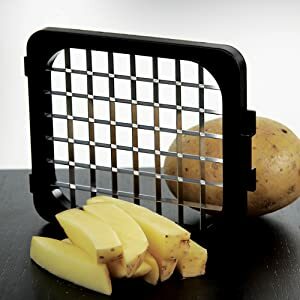 Just open the , set your uncut food directly under the knife grid, and press down, that’s it! When you’re ready to clean it, just slide up the grid insert to lift away any extra scraps. The Chopper is safe to either hand wash or place in the dishwasher. 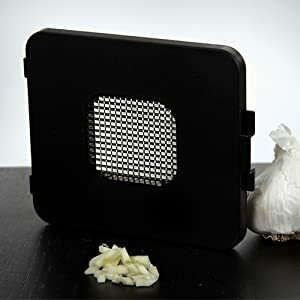 You’ll get the Original Chopper, three interchangeable multi-knife cutting grids, two interchangeable cutting guide grid bases, and the durable, clever BPA-free food collection trap. The modern stainless steel construction will not only compliment your gorgeous cooking space, but it will last for years to come. No more mushing foods with your old chopper. The sharp beveled blades cleanly cut through all types of food. Tedious dicing for your favorite ingredients is a thing of the past. 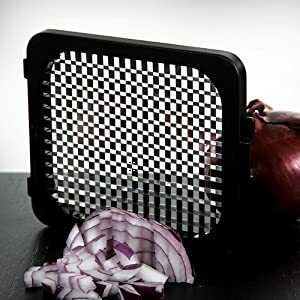 Superb onion dicing without the tears. Larger foods don’t stand a chance against these hefty 1/2” blades.